Gareth McGlynn has returned to Derry City. DERRY CITY manager, Kenny Shiels believes Gareth McGlynn has unfinished business at Brandywell Stadium and is delighted to welcome the midfielder back to the club for a third spell. As revealed in the ‘Journal’ last Friday, McGlynn had been in talks with Shiels about a dramatic return to the ‘Candy Stripes’ over the Christmas break when he returned home from New York. The 33 year-old Inch native has now signed a one year deal with the club and Shiels is delighted to have the Co. Donegal man’s experience in his squad for the 2016 Airtricity League season. “He gives great experience which is exactly what we need and that is vital to our progress,” said the Derry boss. McGlynn, who left Derry City in 2011 when he went travelling to Perth in Western Australia before moving to New York City, has been plying his trade with Bronx-based Landsdowne Soccer Club. And Shiels has no concerns over the players’ fitness. “I’ve no concerns about his fitness,” said Shiels. “He’s in good shape. I’ve met him and you can tell he’s in good shape. He’s been playing right through to the middle of December in America so he should be well up to speed. 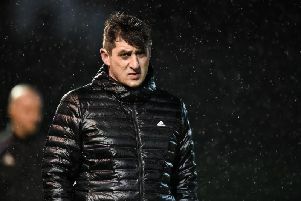 McGlynn, who made his ‘Candy Stripes’ debut in 2001 under Kevin Mahon’s management, moved to Bohemians and then returned to the Brandywell in 2011 before emigrating to Australia later that year.